My intention is to do a piece on each one. This is Part III, which focuses on trade unions. In the UK the top 1% income share has increased from 5.7% in 1978 to 13.9% in 2014. That’s more than 100 billion pounds transferred from the bottom 99% of the UK to the top 1% each year–money which could go to pensions, higher minimum wages, welfare benefits, public services, etc., but is instead going to the wealthy. Over time this is more than a trillion pounds moved from the wage-earning class to the investor class. These two things are deeply connected. Some people imagine that labour markets produce wages which reflect the real value of the work people do, but the employer-employee relationship is always slanted against employees. Employees need jobs to live, and because employers control access to a scarce supply of work, they can pit prospective workers against each other. The ability of individual workers to resist this is limited, because they must work or live in poverty. It is only when workers negotiate together as a bloc that they stand any chance of having the leverage they need to extract concessions from employers. Wages are governed by the relative bargaining power of workers and employers. The weaker worker bargaining power becomes, the less necessary it is for employers to raise wages, and the smaller the share of income working people receive. The less income working people receive, the less money they have to spend on goods. The less money they have to spend on goods, the weaker consumer demand becomes, and the harder it becomes for businesses to prosper. In an economy where employers have all the power, growth stagnates. In an economy where workers have all the power, we might see inflation or inadequate investment for the future. Capitalism is at its best when the power relationship between workers and consumers is at an equilibrium which enables workers to provide a strong consumer base while still leaving investors with enough resources to pursue expansion, research, and development. That balance was the key to the high growth rates and falling economic inequality western states saw in the 50s and 60s. In the 70s, inflation rose while growth plummeted, and the trade unions got the blame. The right argued that the workers had become too powerful, and that the balance needed to be shifted back toward employers. The role of the oil shocks in 1973 and 1979–which sent the price of oil skyrocketing and dramatically increased the cost of everything made with oil or transported by it–has mostly been ignored or trivialised in the public consciousness. When I ask my undergraduate students what happened in the 70s, most of them don’t know, and those who think they know usually only talk about overzealous unions. It’s of course possible that there’s interaction between the oil shocks and strong British unions. 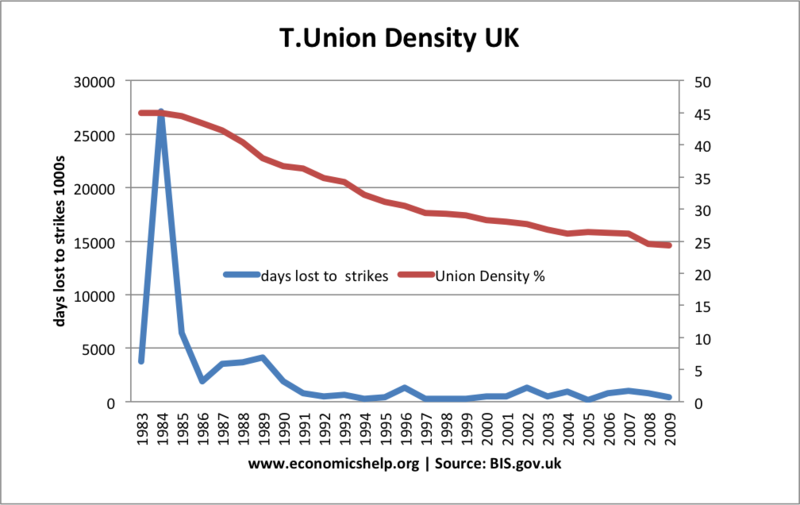 But the resulting Thatcherite 80s policy didn’t just curb the unions a bit–it massively rolled them back, turning them into shells of their former selves. With weaker unions, the ability of workers to resist new encroachments on their share of the economic pie is ever more limited. Globalisation has given firms and employers new devices for intimidating workers–if they’re made to pay taxes, abide by regulations, or honour pensions, they and their firms threaten to relocate themselves and their capital to low wage foreign countries. International economic integration has advanced faster than international political integration, and this creates ungoverned spaces in the global economy which individual states struggle to deal with. Only the left is really interested in closing these gaps, and left wing parties and movements still rely heavily on trade unions for organisation and funding. Weaker unions make it harder for states to get strong left wing governments that might cooperate with one another to close the holes in the international system. Many people with private sector jobs where the pensions are poor or nonexistent understandably grumble about being asked to support strikes by public sector workers for defined benefit pensions. But while it may seem that an academic strike is a strike by the middle class to extract benefits from the working class, this mistakes the relevant inequality in our society. It’s not about the division between the top 20% and the bottom 80% but between the top 1% and the bottom 99%. The middle class and the working class need each other if they are to halt or reverse the slow haemorrhaging of wealth and income to the very rich. The more money the top 1% are able to pry loose from the rest of us, the more resources they will have politically to defend and extend these ungoverned spaces. The more those spaces expand, the harder it is to restore workers’ income share through national political movements. And the more workers’ income shares contract, the more imbalanced investment and consumer spending will become. This lowers growth and contributes to bubbles and economic instability. We are all in this together. A victory for any union in any industry–public or private sector, middle class or working class–defends all of us. A defeat–particularly of a union which is engaged in historic and unprecedented strike action–would make it easier for employers to ignore and dismiss future strike threats from unions up and down the country. It is in that spirit that I hope that even those who have already had their defined benefit pensions stolen from them will support this strike, the labour movement more broadly, and those political organisations which align with it. My own work as a politics PhD student focuses on inequality and democracy, on the ways our political system has failed to meet the distributive expectations of people and the serious problem this poses for democratic legitimacy. While academia may sometimes seem detached or elitist, I and many of my fellow PhD students are deeply committed to doing what we can to ensure the interests of working people are never forgotten. I hope that in our time of need, they will be with us as well.